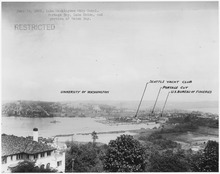 Looking east across Portage Bay to University Bridge and beyond; the University of Washington's south campus can be seen under the bridge. In 1860, landowner Harvey Pike tried to cut the first ditch connecting Lake Washington's Union Bay and Lake Union's Portage Bay, but gave up and deeded his land to the Lake Washington Ship Canal Company, which built a transiting rail line for portaging goods between the lakes. This rail line continued use until 1878. In 1883, David Denny and Thomas Burke had a canal built for floating logs. Cheshiahud lived and carved canoes on the shores of Portage Bay for many years from 1885. In 1909, the Pay Streak, a vaudeville and sideshows section of the Alaska–Yukon–Pacific Exposition, ended in a gondola ramp and esplanade on the north shores of Portage Bay. For 14 years following World War II, the Fantome was stranded in Portage Bay pending payment to King County of back taxes. 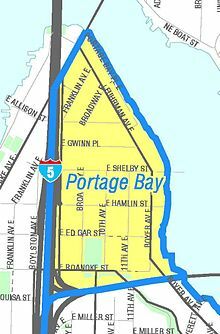 The small residential neighborhood of Portage Bay is located on the southwestern shore of the bay. It is bounded on the south by State Route 520 and on the west by Interstate 5, and features one of the larger remaining enclaves of houseboats in Seattle. ^ Majors, Harry M. (1975). Exploring Washington. Van Winkle Publishing Co. p. 78. ISBN 978-0-918664-00-6. ^ Long, Priscilla. "Montlake log canal first connects Seattle's Union and Portage bays in 1861". HistoryLink.org Essay 3404. Retrieved 29 April 2011. ^ Long, Priscilla (May 4, 2012) [June 24, 2001]. "Chinese laborers dig second Montlake Cut between Union Bay and Portage Bay in 1883". HistoryLink.org Essay 3349. HistoryLink.org. Retrieved 29 April 2011. ^ "Alaska-Yukon-Pacific Exposition, 1909 -- A Slideshow of Seattle's First World's Fair". HistoryLink.org Essay 7082. HistoryLink.org. Retrieved 29 April 2011. Wikimedia Commons has media related to Portage Bay.